Love it. Expensive but excellent quality. Super soft. Really like that it’s slightly oversized for a queen blanket. It’s nice to have that extra length hanging down the sides. The Ultra Velvet® heated blanket reverses to a beautiful quilted dyed to match Micro Flannel® back. This blanket has 6 layers: layers of down alternative fiber, soft wire heating technology, plus Micro Flannel® and Ultra Velvet® fabric on front and back. Tac-tite® quilting prevents wire shift and a stylish satin hem finishes the look. 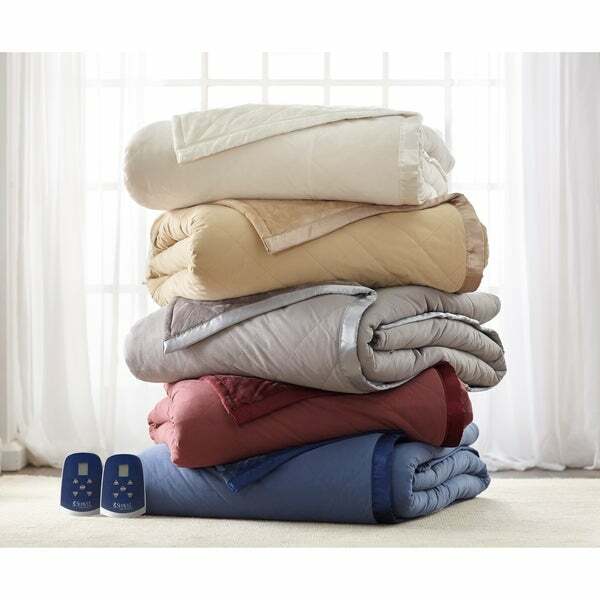 This blanket/comforter adds comfort, warmth, elegance and style to any room. Micro Flannel® is a registered trademark of Shavel Home Products, patent pending. Dimensions 90.0 In. X 108.0 In. X 1.0 In. Great blanket so far. Very warm and snuggly, unlike others I purchased for $60.00 - $80.00. One side of the blanket is quilted and the other side is very soft. I hope it will last for more than a year. Purchased as a gift for my nephew for those cold nights upstate, I’m so convinced I decided to get another as a gift for the holidays.